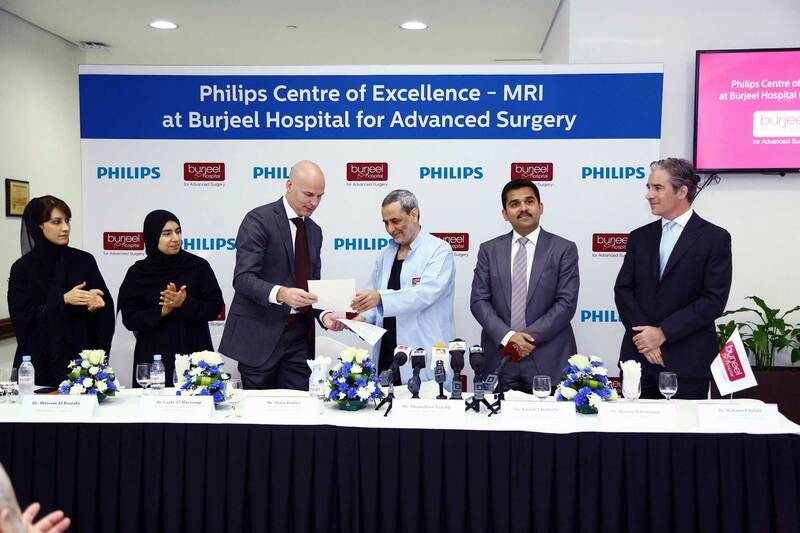 Dubai, UAE – Philips Middle East today announced the opening of its first ‘Center of Excellence’ for diagnostic imaging in the region in partnership with the Burjeel Hospital in Dubai, part of the VPS Healthcare Group. This first of its kind center in the region aims at transforming the future of corrective and replacement surgery through the use of advanced diagnostic imaging techniques. As part of the ‘Center of Excellence’ initiative, Philips will deliver a comprehensive Magnetic Resonance Imaging (MRI) Technologist Development program designed to drive clinical and operational excellence, increase staff confidence and motivation and ultimately drive patient outcomes. "This recognition reflects our never-ending commitment to provide exemplary services and care to all of our patients across the various units of VPS Healthcare. As one of the leading healthcare groups in the region, we strive for excellence and Philips has provided us a great platform for our employees to get accustomed to the latest technology in the market, which again coincides with our commitment to be an innovation driven healthcare provider," said Dr. Shamsheer Vayalil, Managing Director, VPS Healthcare Group. “Philips is proud that we can improve lives with our healthcare innovations, from preventative screening, diagnosis and treatment planning to post-operative follow-up, we are committed to demonstrate our focus on improving patient outcomes,” said Reinier Schlatmann, General Manager Gulf Region, Philips Health Systems. “Our vision is in line with that of the UAE Government to create a world class healthcare system here, known for outstanding care and results,” said Schlatmann. Philips works closely with partners and clinicians to better understand their challenges, and then incorporates those needs into solutions. For example, Philips incorporated those understandings in the development of innovative products like the Ingenia MRI, the world’s first digital MRI system to meet complex imaging needs and provide radiologists with exceptional imaging quality and accuracy. The Ingenia product suite is also being used for the purpose of screening, treatment planning and post-operative follow up providing clinicians ultimately care across the entire health continuum. “The MRI for an orthopedic surgeon is practically his eyes. All advancement of orthopedics that we have seen recently has to do with our ability to diagnose correctly and our ability to plan our surgery pre-operatively in order to offer our patient the best surgical procedure, in the best possible way. The partnership with Philips and their innovative technology with Ingenia MRI have made this precision in diagnosis and the pre-operative planning reach new heights. And it gives me great pleasure to know that we are the first Centre of Excellence in Diagnostic Imaging for Philips in the region.” said Dr. Samih Tarabichi, Medical Director Burjeel Hospital. Through its global and local partnerships, Philips is driving world class innovations and creating an eco-system of clinical excellence in the regional healthcare industry. Royal Philips (NYSE: PHG, AEX: PHIA) is a diversified health and well-being company, focused on improving people’s lives through meaningful innovation in the areas of Healthcare, Consumer Lifestyle and Lighting. Headquartered in the Netherlands, Philips posted 2014 sales of EUR 21.4 billion and employs approximately 108,000 employees with sales and services in more than 100 countries. The company is a leader in cardiac care, acute care and home healthcare, energy efficient lighting solutions and new lighting applications, as well as male shaving and grooming and oral healthcare. News from Philips is located at www.philips.com/newscenter.